It’s been over a month since I revamped this blog yet I hadn’t posted anything new. I have no excuse, unfortunately other than I just hadn’t felt like it! I have still been cooking and visiting blogs for inspiration. Just haven’t been posting them. So here’s one recipe that I picked up from one of my favorite blogs, Kalyn’s Kitchen. We eat a hella lot of pork at our house and it’s nice to come up with a new way of cooking the same ol’ meat. I followed Kalyn’s recipe pretty closely but I tweaked it a bit to suit what I have in my pantry. If you’d like to see the original recipe, see Kalyn’s Pork with Paprika, Mushrooms and Sour Cream. Below is my adaptation of that recipe. 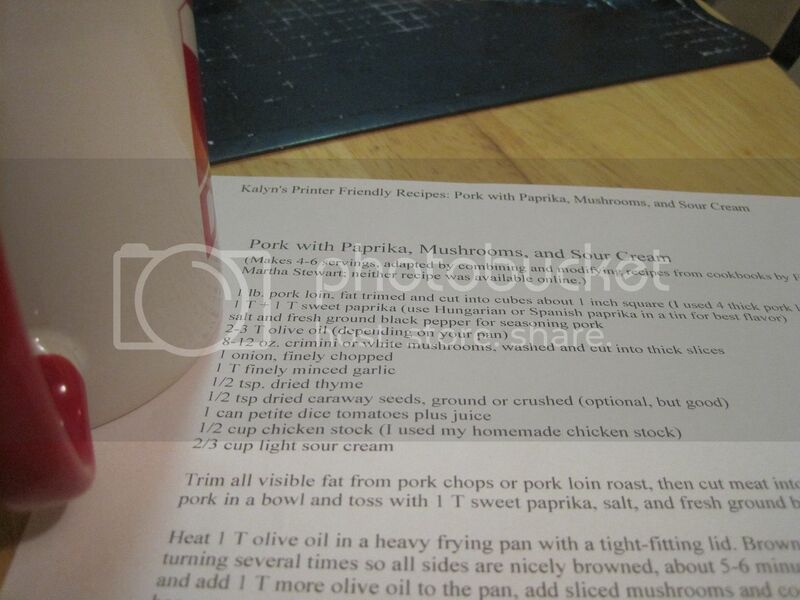 A delicious pork stew adapted from Kalyn's Kitchen. Cut meat into cubes, put into a large bowl and toss with sweet paprika, salt, and fresh ground black pepper. Heat 2 tablespoon of olive oil in a heavy bottomed pot with a tight-fitting lid. Brown pork over medium-high heat, turning several times so all sides are nicely browned, about 5-6 minutes. Remove pork to another dish and add 1-2 more tablespoons of olive oil to the pan, add sliced mushrooms and cook until nicely browned and all liquid has evaporated, about 5 minutes more. Add chopped onion and cook until just starting to brown, about 3-5 minutes. Then add minced garlic, other 1 tablespoon paprika and thyme and cook about 1-2 minutes. Add petite diced tomatoes with juice and chicken stock, bring to a simmer, and cook about 10 minutes, or until the mixture is slightly thickened and flavors are well-blended. After 10 minutes add the browned pork cubes back into the pan, cover and simmer about 40-60 minutes more, or until pork is tender. Add more broth if it looks like your stew is drying out too much. Turn off heat, stir in sour cream, and serve hot. 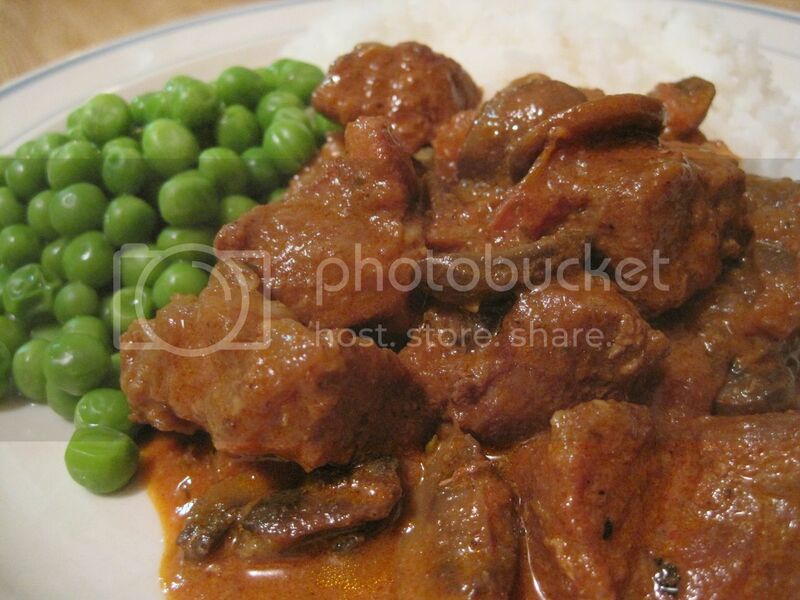 It looks like gulasch! I haven’t done some “real” cooking since the offset of homework and this looks like something I should take time out for. 🙂 Happy weekend to you and yours Jmom! Thanks for dropping by, G! Happy weekend to you too. My family liked this a lot. I’ll have to try serving it with noodles like goulash next time! ooh this looks yum, and the ingredients (except for fresh thyme) is readily available from the supermarket!